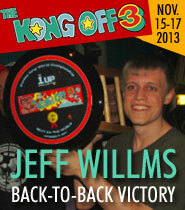 McCrary and Lakeman Dominate 2014's First Donkey Kong Open, KO4 Is On, and Twin Galaxies Is Alive! 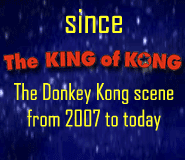 March 6th, 2014 - Here's a quick overview of the first Donkey Kong Online Open for 2014, along with some updates on recent developments regarding the future of the Kong Off and Twin Galaxies. Dave McCrary crushed the tournament with a massive 1,091,400. Not only was this good enough to win the weekend, it was also the highest score ever achieved in any of the six online Donkey Kong tournaments held thus far. In addition, the score pushes McCrary from 14th up to 8th in the all-time rankings. Last year, McCrary was knocked out of the Kong Off 3 main lineup and into the Wildcard Division, so reasserting a top position has been a major priority. Congratulations to Dave for the tournament win, and the payoff to a lot of hard work. In a close second place was Robbie Lakeman, who managed an impressive 1,075,500 during the first half of the tourney, bumping up his personal best by 5,100 points (but not quite moving him up a place in the all-time rankings). Most assumed that Lakeman had the tournament locked up when his score came in, until McCrary's unprecedented run on the second day. 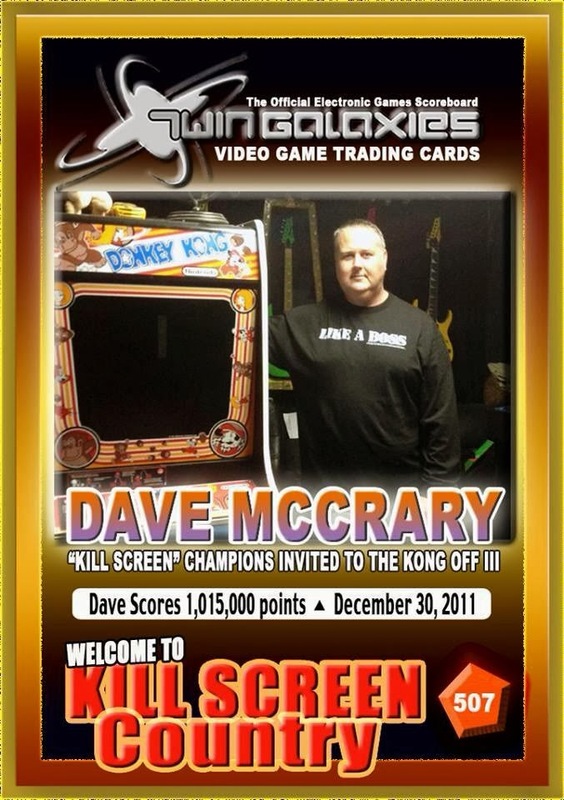 McCrary's rise to 8th this weekend knocked Steve Wiebe and Billy Mitchell down another spot on the all-time scoreboard, to 11th and 12th respectively. 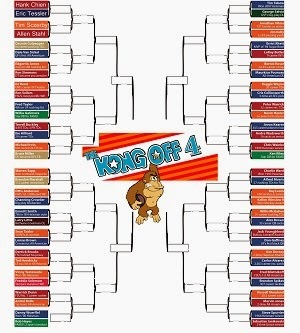 Who could have predicted that less than a decade after The King of Kong both former champs would be pushed out of the top 10? In the days leading up to the tournament, the bounty on the world record received a $50 boost from competitor Daniel Desjardins, and then a mysterious "this tournament only" contribution of $1,000 from an anonymous donor, bringing the total pot to $1,300. The record was not broken, but it added heat to an exciting weekend. 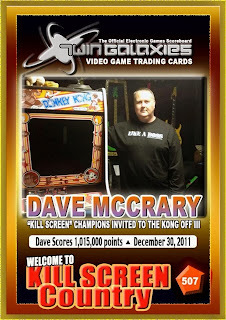 Congratulations also to Jeremy Young, one of our ace score submission referees at Donkey Kong Forum, who achieved his first-ever kill screen during the weekend's action. 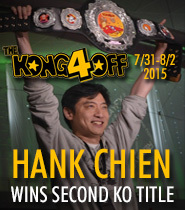 Soon before the tournament began, Richie Knucklez debuted a Facebook page for the Kong Off 4. The next installment of classic gaming's biggest event will be held in New Jersey, and will depart from the usual "highest score wins" format with a bracket-style elimination tournament. Response from the community has been positive, and we are all excited to see how it will come together. 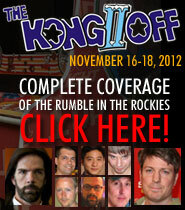 Online Open organizer Eric Tessler announced that the results of the weekend's tournament—the first in a series of six—would play into the Kong Off 4 seeding process, but further details have yet to be revealed. The location on their "About" section was updated as well, with a new address based in North Hollywood. The spirit of Twin Galaxies is quite alive and at the moment going through a significant restructuring period. Out of courtesy and respect for all involved parties and the community itself, no public announcements or details are currently being made available. Please know that the frustration and lack of information that has been felt by the community for quite some time, has been felt by everyone involved, on all sides, one way or the other. Resolution on all matters that involve this restructuring are being sought as quickly as possible. It looks as though the phoenix of video game scorekeeping will, once again, be rising from the ashes! The imminent re-emergence of Twin Galaxies, however, does not change the DK community's position that the Forum's scoreboard will continue to have primacy over TG's as far as our game is concerned. The high score list at DKF is still going to be the most complete, accurate, stable, transparent, timely, and easy to submit to, at least for the foreseeable future. I am, nonetheless, happy to see TG stirring, and look forward to the day when we can submit scores there again. The return of TG should be taken with a grain of salt. Who is the REAL owner of Twin Galaxies? Robert Mruczak paid for the TG website! Don't waste your time with more TGBS. Go to Guinnessworldrecords.com to submit records.